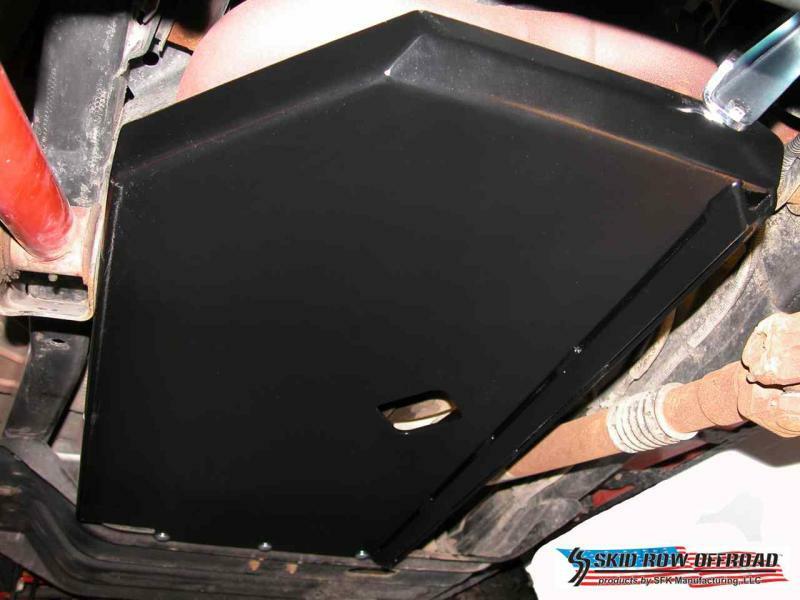 Our engine/transmission skid plates are available for all 1997-2006 Jeep TJ Wranglers. They are designed to provide complete coverage for your vulnerable engine oil pan, transmission, AND the front portion of your exhaust system. Unlike some of our competitors, you don't need to buy two different skid plates to get less coverage. 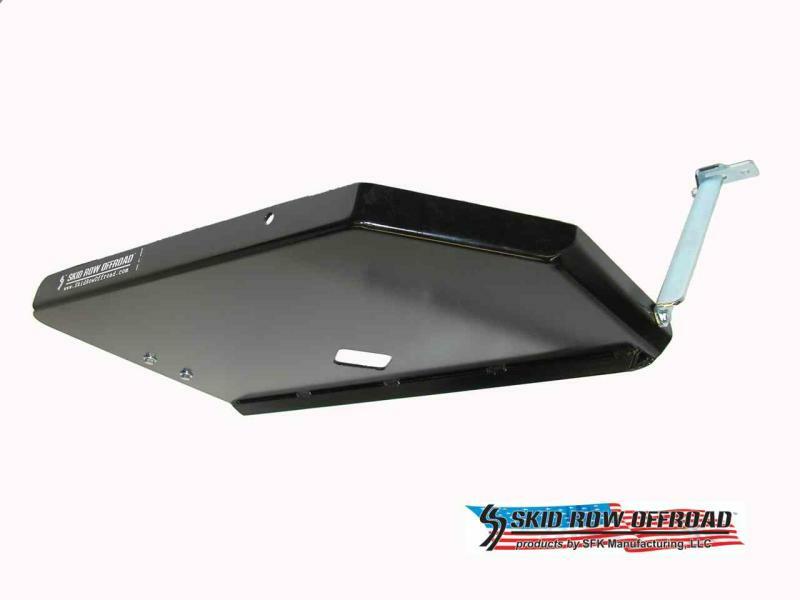 One easily installed skid plate provides the complete protection you need to feel confident while on the trail. These skid plates are made of 3/16" thick steel that is laser cut and CNC folded for consistent quality that sets the standard for Jeep skid plates. They are also reinforced with 1/4" thick steel angle along the driver's side to provide plenty of strength while easily clearing both your exhaust system and your driveshaft. (Most of our competitors have interferences with one or the other, but not Skid Row Offroad!) Our skid plates are also sand-blasted prior to being powder-coated to assure that the finish adheres better than our competitor's coatings. We use a semi-gloss black for an attractive finish that's easy to touch up when necessary. Our TJ engine/transmission skid plates mount solidly to the Jeep's frame and are specially designed for easy bolt-on installation. No drilling is required for 1997-2002 models, while 2003-2006 models require drilling of 3 holes in the leading edge of the transfer case skid plate. There is plenty of clearance for the driveshaft during full articulation of the front axle. 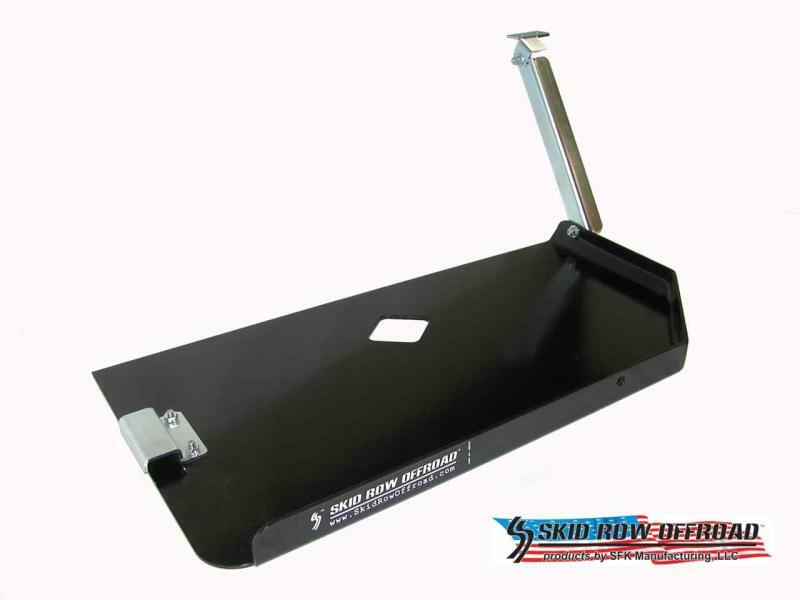 Skid Row engine/transmission skid plates require no modifications and are designed to work with or without a suspension lift. This gives you the protection you need when you're starting out with a stock height vehicle that puts your oil pan closest to the rocks. And when you're ready for that 3-4" lift, there's no need to modify your Skid Row engine/transmission skid plate or get a new one. We've also learned during our off-road testing that these engine/transmission skid plates help you get over obstacles by preventing your transfer case skid plate from catching on whatever you're driving over. So you not only get added protection and peace of mind, your Jeep will be more capable as well!! Please note that these skid plates do NOT work with long arm suspension systems. 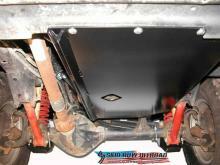 We have engine/transmission skids available specifically for Jeeps with long arm suspension systems. Click here for more information. Also, if you have an aftermarket exhaust header that goes under your engine or transmission, our skid plate will not fit properly. 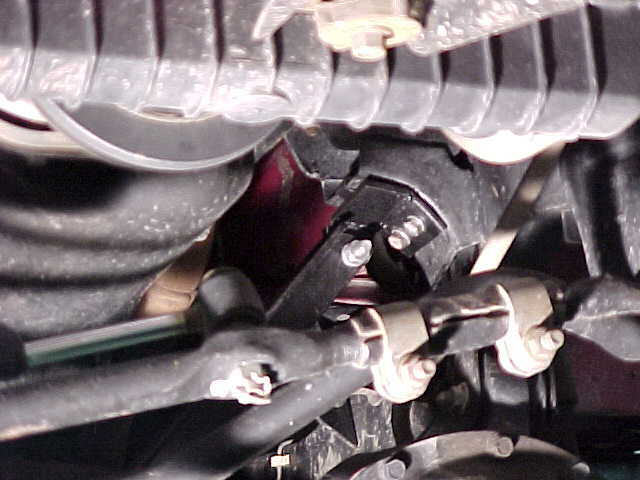 An example would be the Borla exhaust header for 1997 model TJ's. If you're unsure, it's best to contact us and ask. These skid plates work just fine with transfer case drops and can be mounted to Jeeps with raised transfer case skid plates such as Tera Mfg's Belly-Up kit or Nth Degree's Tummy Tucker. However, a slight modification will be needed to mate our skid plate to the Tummy Tucker.